Ambassadors of the Republic of China (Taiwan) and ministers of the Nevis Island Administration met at the social security building on Sept. 26 to witness a large donation package sent over by the government of the Republic of China (Taiwan) and several humanitarian organizations based out of Taiwan. The donations included 450 boxes of everyday goods, 12 Asus laptops, a check allocated for the purchasing of four new government vehicles and two tractors donated to the ministry of agriculture. These donations are part of a long-term effort by the Republic of China (Taiwan) to support its diplomatic allies across the globe, and were extended after hurricanes Irma and Maria impacted day-to-day life on Nevis. The 450 boxes of goods included children’s items, men and women’s clothing, shoes and housewares. This donation was made by the Simply Help foundation. The foundation’s mission is to relieve poverty by providing emergency disaster relief, vocational training and shelter and care for the homeless elderly across the world. The Republic of China Taiwan’s ambassador to St. Kitts and Nevis, George Gow Wei Chiou, represented the Taiwanese non-profit organizations providing aid to Nevis. 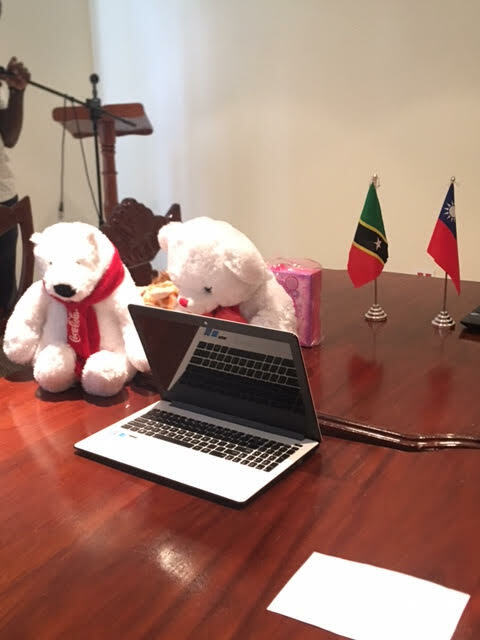 The Asus Foundation donated 12 laptops to the ministry of education in an effort to increase communication technology cooperation between Taiwan and St. Kitts and Nevis. The premier of Nevis, the Honourable Vance Amory, recognized the need for the new technology as examinations at the high school level become increasingly digitalized. In addition to the gifts by these charitable organizations, the Republic of China Taiwan’s government donated a check to the Ministry of Agriculture to increase the island’s ability to not only grow crops, but also respond to the crop devastation that comes when a major hurricane passes. The partnership between the Republic of China (Taiwan) and St. Kitts and Nevis is one that goes back to the federation’s independence 34 years ago. The country was the first to accept St. Kitts and Nevis as a diplomatic ally and the relationship has continued to bear fruit for people of both nations in the years since. Next articleDouglas a Double Agent?